Powerful Hurricane Irma churns toward Puerto Rico on Sept. 5, 2017, in this view from the NOAA/NASA GOES East satellite. The second-largest radio telescope in the world has suspended operations as powerful Hurricane Irma churns ever closer. The Arecibo Observatory in Puerto Rico, which features a 1,000-foot-wide (305 meters) radio dish, is closed for safety reasons until further notice, telescope representatives said via Twitter on Tuesday (Sept. 5). Arecibo representatives also posted several photos on Twitter of personnel clambering about the huge radio dish, installing or securing equipment. "Taking preventive measures for #HurricaneIrma," they wrote about the photos. As of Tuesday evening, Irma had ramped up to a Category 5 hurricane — the most powerful type — with maximum sustained winds of around 185 mph (300 km/h). 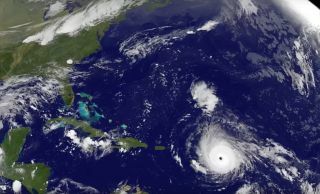 The storm, which the U.S. National Weather Service (NWS) has described as "potentially catastrophic," is bearing down on Puerto Rico and the U.S. Virgin Islands. "Irma is forecast to move just northeast of the local islands Wednesday afternoon through early Thursday morning," NWS officials wrote in a statement. "Irma is expected cause dangerous winds, storm surge, rip currents and rainfall impacts across the local islands. Hurricane-force wind likely across the Northern U.S. Virgin Islands, Culebra, Vieques and northeast Puerto Rico, with strong tropical-force winds elsewhere." Irma may later barrel into southern Florida as well, forecasters have said. The Arecibo Observatory began observing the heavens in 1963. Ever since its debut, astronomers have used the big dish for a variety of purposes, from capturing radar images of asteroids to listening for possible signals from intelligent aliens. Arecibo also famously served as the backdrop for a dramatic scene in the 1995 James Bond film "GoldenEye." Irma is following closely on the heels of Hurricane Harvey, which slammed into southeast Texas late last month and lingered, devastating the region with record-breaking rain and flooding.